As part of this preparation, he sat down with the BBC last weekend to discuss a wide variety of issues. A key point he made in this interview was that in its effort to combat the ongoing economic crisis, Russia should strive to steer its economy away from relying on commodities. But is there any other way for this country to go? Along with making it clear that he is Vladimir Putin's boss and not vice versa, Medvedev outlined Russia's priorities during the global financial crisis. He vowed for continued support of the non-financial sector, hit hard by the credit crunch and depleting production amid low demand. 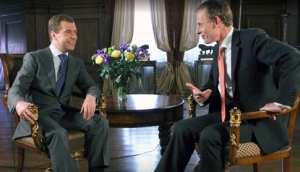 Medvedev also insisted that the country is as serious as ever about finding a way out of its addiction to commodities. "We have stated before that our economy is not diversified enough, that it is predominantly reliant on commodities. The crisis hit export-oriented countries particularly hard, and Russia was among them. IT has long been our priority. We have to support domestic demand, we have to develop small businesses which are dependent on the global economic environment," Medvedev told the BBC. Medvedev added that Russia's clear priority was to pursue diversification and modernization and place more emphasis on the high technology sector. Russia has long been trying to change its humiliating image of being little more than the West's raw material producing colony. The previously booming economy was almost exclusively supported by skyrocketing oil and gas prices, which have now considerably fallen. But despite the disastrous consequences for the economy, this fact was seen as a blessing in disguise, finally giving Russia a practical reason to break the vicious cycle of commodity reinvestment, which helped garner immediate profits, but did little to help the overall economic development. "We brought this trend about some five years ago, when we started actively reinvesting the high oil and gas profits back into the energy sector. That's how we became its hostage," said Geldy Soyunov, an analyst at the Otkrytie financial corporation. Breaking out of this captivity might prove to be an incredibly difficult task even amid the turn-around in the global commodity market. Since the inception of the economic crisis, calls have been made to take the best advantage of it to modernize producing capacities and turn the focus away from the energy sector. Russia has unveiled massive long-term projects aimed at developing transport, building roads and other infrastructure. Military spending was also increased considerably, supposedly to indirectly provide financing for real sector businesses working as contractors. However, the numbers do not look that inspiring. Russia's foreign trade turnover posted a 46.6 percent year on year decline in the month of January. The changes in export and import structures look even more troubling. According to the Federal Customs Service, commodities now make for three quarters of Russia's exports, while the share of high tech in imports fell by ten percent. Domestic investors and businesses aren't thinking about revamping their capacities, simply looking to preserve as much as they can, hoping to just pull through the crisis. Investments into commodities are actually likelier now than before the crisis, with even the state incentives doing little to turn the corner. "I think it's more like trying to put a band-aid over an amputation. It's something so serious that the proposition of trying to invest into those infrastructures makes enormous amounts of sense, but everyone's so scared that they're just thinking about the safe thing to do. And the safe thing to do is not to try these new schemes, because that might backfire," said Mark Batey, a lecturer in Organizational Psychology at the Manchester Business School. "It's safety in numbers. If everyone's doing commodities, I'll do commodities, too," said Batey. Efforts are being made to bolster investor confidence by pledging more support to the non-financial sector. Back in February at the Russia-2009 investment forum, the Deputy Transport Minister Alexander Misharin suggested that the state could revisit investment plans into some of the transport projects that have been announced, subsequently increasing the share of state funding to as much as 75 percent of the total. Last month, Prime Minister Vladimir Putin called on the sponsors of the Sochi Olympics to start making investments in a timely manner, and said that the government was prepared to provide aid for those experiencing difficulties with financing. "All of these large scale projects will not produce a significant effect. The state is attempting to make massive investments in new schemes. At the same time, those projects already planned have seen their funds dwindle. The money is more expensive now and the government will be very selective about funding any new beginnings," said Soyunov. In the meantime, oil prices posted the highest single month growth rates since June last year. In March, oil jumped by 9.9 percent. Obviously inspired by these developments, Citi upgraded Russian equities to overweight, and changed its forecast for the RTS index, now set to grow by over 30 percent to 950 by the end of the year. Oil companies are likely to use the growing profits to contribute to switching gears, now leaning toward downstream and marking one of the few diversifications that are going to matter. "More companies will go into refinement, this business is more profitable now than just crude exports," said Soyunov. The development of the energy sector looks more and more like Russia's only feasible anti-crisis strategy, and could be even more of a factor in the economy once the dust settles on the economic downturn. "When we are talking about the real diversification and modernization of the economy, it should take a complex approach covering about every aspect, and it will take some 20 years to see some results," added Soyunov.